Since its introduction in March 2013, the EOS Rebel SL1, the world's smallest and lightest digital SLR camera, has provided photographers of all levels with a high-performance digital SLR in a small, compact camera body. The new white EOS Rebel SL1 Camera Kit is complemented by a matching white EF-S 18-55mm f/3.5-5.6 IS STM lens and offers a stylish alternative for photographers who like to stand out from the crowd. "Having just reached a milestone of producing 100 million EF lenses, Canon is dedicated more than ever before to its heritage of creating outstanding optics for photographers of all levels," said Yuichi Ishizuka, president and COO, Canon U.S.A., Inc. "The EF 16-35mm f/4L IS USM and EF-S 10-18mm f/4.5-5.6 IS STM ultra-wide zoom lenses, when paired with Canon EOS Digital SLR cameras, are powerful tools that can enhance any photographer's creativity. And new to the U.S. market, the white EOS Rebel SL1 Digital SLR camera with its companion white lens, provides users with high-quality images in a small, compact body that is easy to bring along on all their summer adventures." Fully compatible with all EOS Digital SLR cameras including full-frame models like the EOS 5D Mark III and EOS 6D Digital SLR cameras, the compact and lightweight EF 16-35mm f/4L IS USM ultra wide-angle zoom lens offers high image quality and an Optical Image Stabilizer (IS) for shake correction up to four shutter speed steps, making handheld shooting possible in dimly lit scenes where camera shake can occur. In addition, an intelligent CPU in the lens automatically selects the optimal IS mode by recognizing differences between normal handheld shots and panning. This technological advancement supports a greater range of creative expression for photographers in otherwise difficult shooting situations, such as dark indoor scenes where flash photography is prohibited, or in places where a tripod cannot be used, or when shooting at low ISO speeds. Created to be a great companion lens for the Canon EOS 70D, EOS Rebel T5i, EOS Rebel SL1 and other EOS Digital SLR cameras with APS-C size image sensors, the EF-S 10-18mm f/4.5-5.6 IS STM lens expands Canon's line of Stepping Motor (STM) lenses. For entry-level users, this affordable wide-angle lens offers the ability to shoot creative, high-quality images and video in tight indoor locations such as a cozy corner table in a restaurant or unique vacation photos where the subject is close up, yet the surrounding area can still fill the frame. The EF-S 10-18mm f/4.5-5.6 IS STM ultra wide-angle zoom lens features a compact and lightweight design with an Optical Image Stabilizer for shake correction up to four shutter speed steps, enabling handheld shooting in low light. The lens' stepping motor and newly designed focus mechanism are ideal for Canon EOS Movie Servo AF (available on EOS 70D, EOS Rebel T5i and EOS Rebel SL1 cameras) to provide smooth, quiet and continuous autofocusing during. video shooting, as well as when taking photos. London, UK, 13 May 2014 – Canon today introduces two new high-performance, wide-angle zoom lenses to its EF range – the EF 16-35mm f/4L IS USM and EF-S 10-18mm f/4.5-5.6 IS STM. Designed for experts and enthusiasts, the EF 16-35mm f/4L IS USM is a professional quality L-series lens, offering exceptional performance throughout the zoom range. The compact and lightweight EF-S 10-18mm f/4.5-5.6 IS STM is for Canon’s consumer range of APS-C sensor EOS DSLRs, and ideal is for people who want to expand their view and get more into each shot – with both optical IS and STM technologies helping to deliver consistently sharp and crisp wide-angle stills and HD movies. The EF 16-35mm f/4L IS USM provides greater versatility for professionals and keen enthusiasts who regularly capture wide-angle perspectives – such as landscape or architecture photographers – or those who typically shoot in confined spaces. The lens offers wide-ranging flexibility, with first-class optical construction and a fixed f/4 aperture providing clear, sharp results even in the most challenging situations. The new EF 16-35mm f/4L IS USM is Canon’s first ultra-wide L-series lens to feature Canon’s signature optical Image Stabilizer (IS) technology, which offers a four-stop advantage over non-IS lenses and helps to ensure that shots are always captured with precision detail. The newly-designed IS system also features a number of additional improvements, including gyro sensors for greater accuracy in traditional shooting or when capturing panning motion. Photographers can quickly achieve focus using the powerful, fast and silent autofocusing (AF) performance of Canon’s pioneering ring-type Ultrasonic Motor (USM) – ideal when shooting in AI Servo AF mode. Complete control over image composition is also possible using the lens’s full-time focus ring in manual and AF modes, giving photographers the freedom to fine tune focus on demand. Designed to deliver the highest image quality, the lens’s optical structure includes two Ultra-low Dispersion (UD) elements to minimise chromatic aberration and eliminate colour blurring. Super Spectra Coatings reduce ghosting and flare, while fluorine coatings on the front and rear elements prevent dust and water drops sticking to each element. Photographers can also enjoy beautiful background blur and bokeh thanks to the lens’s 9-blade circular aperture. The lens’s exterior is optimised to provide exceptional ease-of-use and professional performance. The high-grade design includes a compact and lightweight shape that’s comfortable to hold, whilst providing intuitive access to the zoom and focus control. A leather-texture coating also provides a professional feel. The new EF-S 10-18mm f/4.5-5.6 IS STM is the ideal lens for people looking to widen the range of their existing kit and get more into every shot. The lens’s impressive ultra-wide 10-18mm focal range provides the freedom to capture a diverse range of scenes, from holiday snaps of vast, sweeping landscapes and cityscapes, to wide group shots in confined spaces at parties and celebrations. Using Canon’s expertise in optics, the wide focal range is packed into an impressively compact and lightweight lens, which can comfortably fit into kitbags, or even small handbags and backpacks when travelling. Consistently sharp and steady handheld results are provided by a four-stop optical Image Stabilizer. Additionally, Canon’s STM technology ensures high-performance AF when shooting stills, and near-silent AF when capturing movies. Combined with EOS DSLRs that support AF during movies, STM technology provides fluid continuous focus, ideal for tracking moving subjects, and providing smooth transitions as focus shifts between subjects. Quiet focusing also prevents unwanted noise interfering with movie soundtracks, ensuring that recorded sound is both crisp and faithful to the original scene. The EF-S 10-18mm f/4.5-5.6 IS STM features both a UD lens element and a range of optimised lens coatings to deliver outstanding image performance at all focal lengths. 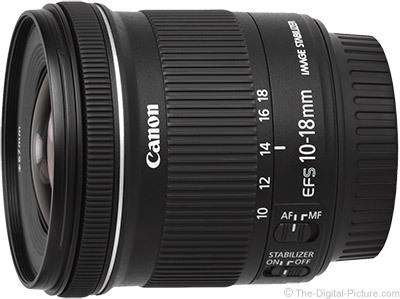 Back to the Canon EF-S 10-18mm f/4.5-5.6 IS STM Lens Review.